Throughout American history, white folks, mostly Christians; there's that dirty “C” word which the left despises; suffered, sacrificed and died to help set blacks free and move them forward. And yet, Sharpton and company uses Black History Month to promote the image that every black achievement was made “in spite of” white America. 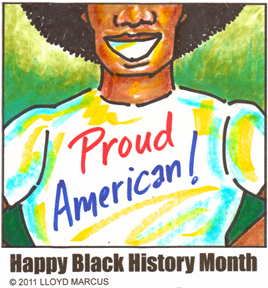 Just once, I would love to see Black History Month focused on celebrating the tremendous contributions by blacks in all areas of American life. Include a few “shout outs” to decent God fearing righteous white folks who helped. That would aid in bringing our nation together as opposed to the month being used divisively for political exploitation and extortion. Our liberal anti-American public school system, the liberal media and black race profiteering so-called leaders make no effort to encourage black youths to be proud Americans. They even discourage it. Their efforts are focused on creating proud “Africans” who happen to live in America. The fact that the highest office in the land is occupied by a black man confirms that the good in America's history outweighs the bad. And yet, Sharpton and company would love to broadcast footage of the KKK lynching blacks 24/7 for the entire month of February. By the way, the KKK was founded by Sharpton's homeys, the democrats. Meanwhile, much of white America's efforts to “do the right thing” are ignored. For example, how many black youths are aware that ending slavery was a major issue of the Civil War. On the side desiring to end slavery, 360,000 mostly white soldiers died. How many black youths know the Republican Party ended and abolished slavery in the United States and have championed Civil Rights more than any other political party?